Telstra has launched a new National Rugby League (NRL) app for iOS and Android smartphones, just in time for the kickoff of the 2013 season. The highlight of the app is a subscription video service that allows users to watch live rugby league games but there are some annoying caveats for Android users. The NRL Live 2013 app is a free download via Apple's App Store and Google's Play Store for iPhone and Android devices, respectively. The subscription video component of the app, which enables users to watch live games, requires an in-app payment. The live video service costs $5.49 for a weekly subscription, $14.99 for a month or $89.99 for a full annual pass. Strangely, the weekly fee option is not available for Android users and only works on the iOS version of the app. Android users only have the option of monthly or annual subscriptions. Some of the features of the NRL Live 2013 app, as advertised on the Telstra website. Weekly and monthly subscriptions to the video service in the app are automatically set to auto renew once purchased. For example, if you purchase a monthly subscription you will be billed for the following month as an automatic payment, unless you choose to manually cancel the subscription. 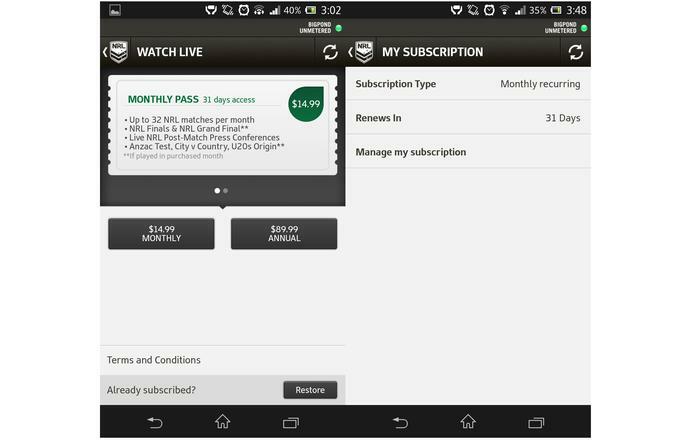 The video subscription service in the NRL Live 2013 app allows users to watch every NRL game but the Nine network's delayed coverage of selected games will unfortunately translate to the app. Up to six matches per week will be streamed live in addition to any that are broadcast on delay by Channel 9. 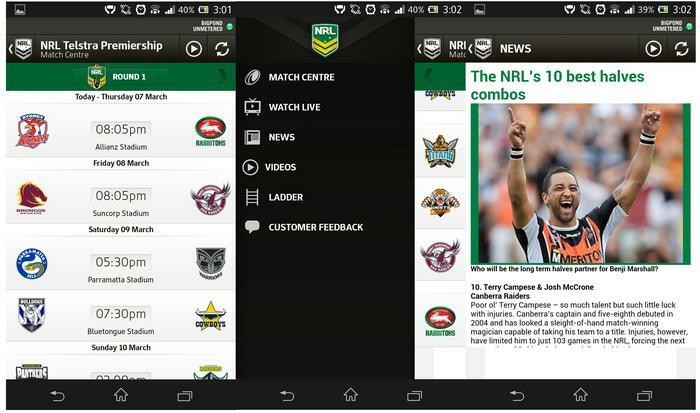 Basic features of the NRL Live 2013 app include match details, news and the competition ladder. Along with the regular 2013 NRL season and NRL Finals series matches, live streams will also be available for the International Anzac Test Match, the U20's Holden Cup competition, the State of Origin series and the City vs. Country game. Subscribers will also be able to stream post-match press conference videos. For users of the app who don't subscribe to the subscription video service, video highlights of matches will be available to view for free. The NRL Live 2013 app also allows non-subscribers to see the premiership ladder, live scores and statistics, the NRL match schedule, match and broadcast details, pre and post game match reports and general news. The live video service has a weekly subscription, monthly or yearly subscription, but the weekly option isn't available on Android. NRL Live 2013 for iOS is compatible with iPhone, iPod touch and iPad devices running iOS 5.1 or later and is optimised to fit the screen of the iPhone 5. However, the app hasn't been designed to natively work on the iPad, so it won't fill the screen. For Android users, Telstra says the app is "built and tested" for a select range of devices running Android 4.0 Ice Cream Sandwich and above. Among the listed models on Google's Play Store are the Samsung Galaxy S II, Galaxy S III, Galaxy S III 4G and Galaxy Note; the HTC One X, Velocity 4G and Wildfire S; the Sony Xperia Arc and Xperia S; the LG Optimus Spirit, the Motorola Defy and the Telstra Active Touch. 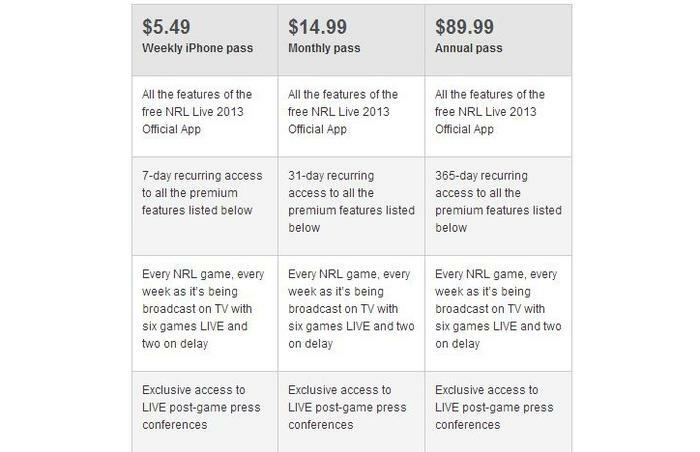 The subscription pricing structure for the NRL Live 2013 app. Despite this compatibility list, we managed to use the app on the Sony Xperia Z with no issues so it is likely to be compatible with plenty of other devices, too. Like the iOS version, the Android version of NRL Live 2013 has not been designed for tablet devices. Despite being developed by Telstra, NRL Live 2013 is not restricted to a mobile network carrier. Telstra users will not incur any data costs when using the app or streaming live video but the app will work with any Australian mobile provider. The NRL Live 2013 app can be downloaded here for iOS and Android.